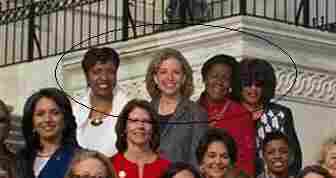 Now You Don't See Them, Now You Do: Pelosi Defends Doctored Photo : The Two-Way Four of the women who are members of the House were a little late to a group photo Thursday. So Pelosi's office digitally added them later. It's a "historic record of who the Democratic women of Congress are," the minority leader says. Calling it a "historic record of who the Democratic women of Congress are," House Minority Leader Nancy Pelosi today defended the move by her office to alter a photo taken Thursday on the steps of the Capitol so that four female lawmakers who were late could be "seen" with their colleagues. The Poynter Institute has an account of what happened. Update at 3 p.m. ET. Today's Meme? We can't be sure he's the first, but Patrick Hedgecoth of Sun Publications in Florida has already added some characters to the photo (Santa, Darth Vader, Gollum; you get the idea). So a meme may be building. ABC News' Jon Parkinson was there when the shots were taken and helps confirm the IDs of the four who arrived late: Rep. Corrine Brown of Fla.; Rep. Yvette Clarke of New York; Rep. Sheila Jackson Lee of Texas; and Rep. Debbie Wasserman Schultz of Florida. 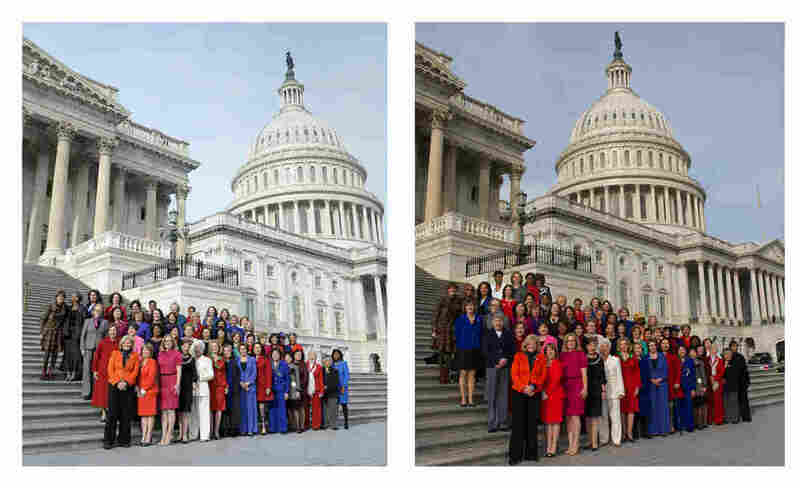 At left: An Associated Press photo taken Thursday as female House Democrats posed outside the Capitol. At right: The image produced by Pelosi's office, which adds four women to the top row, in the middle.